This post details how grips are produced and how grips can be customised in Artichoke V1.2. When using Serial control, the grip is selected based on the grip number (G#) entered, when using muscle control, the grips are cycled through from 0-7 when the outer forearm muscle is tensed for a set duration, and when using HANDle control, the grips can be cycled through by pressing either of the buttons. Each grip pattern is simply a combination of the individual finger positions, and each grip movement is a conversion of the desired grip position into the desired position of each finger within the grip. Passing a value of 0 - 100 to Grip.setPos() and then calling Grip.run() will map the target position from 0 - 100 to an individual position for each finger, using the positions in the defaultGripPos[ ][ ][ ] array (in Grips_default.cpp). Without needing to know how the grip positions are processed (discussed in ‘COMPLEX’ section), you can modify the positions of the fingers within each grip by modifying the values within the 'default_GripPos[ ][ ][ ]' array within the 'Grips_default.cpp' file. The array is split into 7 segments, where each segment represents one of the 7 grips. Each grip segment is then split into 5 columns, a grip position column (COUNT) and 4 finger position columns (F0 - F3 & F4). The array can be read by looking at the grip segment you wish to modify, then read down the grip position column to the grip position at which you wish to modify the finger positions, the finger position at that grip position can then be changed. For example, if you wish to modify the position of a finger when the hand is closed in the point grip, you would look at the third segment (POINT), look along the bottom row (COUNT = 100) and modify the finger position of the desired finger. Both FULLY_OPEN and FULLY_CLOSED are defined presets within FingerLib.h, and are the maximum and minimum positions of the motors (50 - 973). As detailed above, the array is read by first reading from the segment relating to the grip, the grip position is then used to determine the row of finger positions to use, however the actual function of this grip control is slightly more complex. The class method 'Grip.run()’ starts by looking through the COUNT column of the desired grip pattern, and searches for two elements that the target grip position (0 - 100) is between. For example, in the above image, a grip position of 5 would be between Row 0 (COUNT = 0) and Row 5 (COUNT = 100); any BLANK positions are ignored and passed over. After determining the two count values either side of the grip position (COUNT = 0 and COUNT = 100), the position of the finger is determined by reading the finger position along the same row as the COUNT values (e.g Row 0 & Row 5). If the finger position reading along the upper COUNT row is read as BLANK, then the finger position from the row above is used, and if the finger position reading along the lower COUNT row is read as BLANK, then the finger position from the row below is used. The grip position (0 - 100) is then mapped from the range of COUNT (0 - 100), to POS (finger pos at upper and lower COUNT vals), which calculates the finger position values between the ones in the array. For example, to add an intermediate position for one of the fingers, simply add a position within the COUNT column (e.g. COUNT = 50) and then assign a position to a finger within the relevant finger column, on the same row as the COUNT = 50. For more details see our old tutorial here. In this tutorial you'll learn how to download and install the Beetroot V1.0 firmware for the Brunel robotic hand. Beetroot is the version of hand control firmware designed for the Brunel hand, running on the Chestnut PCB. Beetroot includes full serial control of individual fingers and grip patterns, muscle control through EMG sensors and provides a framework for adding extra functionality to the hand (nunchuck/joystick control). 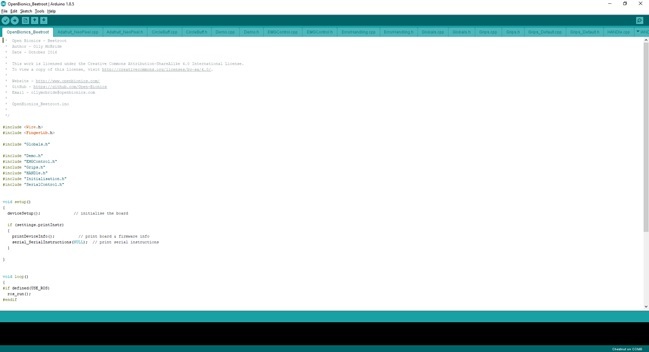 Navigate to the Arduino downloads page. 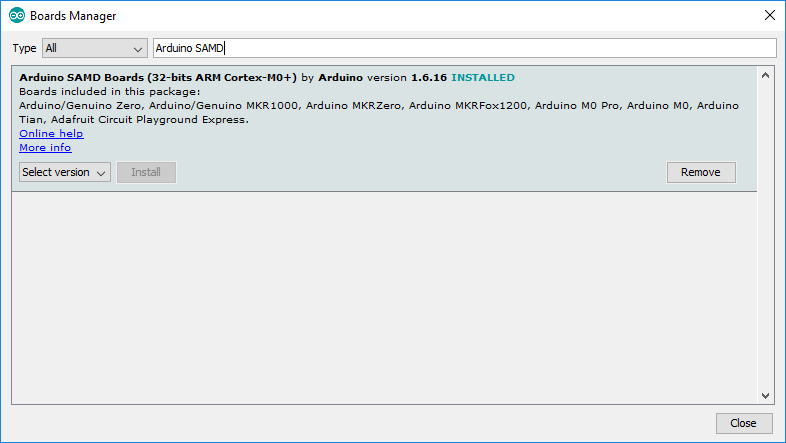 Download and install the latest version of Arduino (click here for Arduino installation tutorial). Navigate to the Beetroot repository on GitHub. Click the Clone or download button. Navigate to the downloaded .zip file Beetroot-master.zip and extract it. Open the file at Beetroot-master\Beetroot-master\OpenBionics_Beetroot\OpenBionics_Beetroot\OpenBionics_Beetroot.ino. FingerLib.h is designed to run on a number of different Arduino compatible microcontrollers, and manages all of the low level motor control and handling of timers, it also includes various example sketches for simple finger control applications. This library can be used to control up to 6 fingers, which allows control of an Open Bionics robotic hand. Each finger is actuated using an Actuonix (aka Firgelli) linear actuator, where the position is determined by using the embedded linear potentiometer. FingerLib.h has been designed to closely resemble the Servo.h library, to allow ease of implementation for hobbyists and researchers. Within Arduino, select Sketch -> Include Library -> Manage Libraries. Select the latest version and click Install. Within Arduino, select File -> Preferences. Select Tools -> Boards -> Boards Manager. Select Tools -> Board -> Chestnut. Plug the USB micro into the hand and the computer. Plug the hand into the supplied 12V DC jack. Within Arduino, select Tools -> Port -> COM## (Select the COM## port number that is not COM1, see here for more details). Select the Upload button (alternatively select Sketch -> Upload). Once the Beetroot firmware has been uploaded to the Brunel hand, connect to the hand via the Serial Monitor by selecting the Serial Monitor button (alternatively select Tools -> Serial Monitor). On the bottom right hand corner of the Serial Monitor, set the baud rate to 115200, and set the line ending to 'Carriage Return'. Upon successfully connecting to the hand via the serial connection, you should be greeted with a printout of the firmware version number and board name, followed by a list of possible serial commands. These commands consist of a single character followed by a number (e.g. F0, G3, P50) and are case sensitive. After displaying the serial commands, the hand should then enter a demo mode. This mode can be by entering 'A0' (without the apostrophes). Entering 'A0' toggles whether demo mode will run on start-up (default enabled), and entering 'D' will run demo mode once. Whenever the hand is connected, if you enter '?' the hand will print the list of serial commands, and entering 'A1' will toggle whether the serial commands display on start up. Note that all characters must be uppercase. With demo mode disabled, if you enter 'G0' the hand should close in grip pattern 0 (Fist Grip), if you enter 'G0' again it should toggle the hand open in grip pattern 0. For a more detailed explanation on the grip patterns and how to create custom grips, visit this tutorial. The fingers can be controlled individually by entering 'F#', where # is a finger number between 0 - 3. You can also set the fingers or a grip to move to a certain position between open and close (P0 – P100). For example, if you enter 'G5 P50', the hand will move to the halfway position of the Tripod grip. If you enter 'F1 P10', the Index finger move to the ‘almost fully closed’ position (P0 = fully open, P100 = fully closed). The speed can also be controlled by using the ‘S###’ modifier, where ‘###’ is a number between 0 – 255. For example, if you enter ‘G0 S230’, the hand will move in the Fist grip at a speed of 230. Note that the fingers may not move at a speed < 200 due to the fingers being under load. The direction can be controlled by adding the modifier of ‘O’ or ‘C’ for Open or Close respectively. The position, speed and direction modifiers can all be applied to a grip (G#) or a finger (F#) command at the same time. 'F1 P50 S240' will move the index finger to the middle position at a speed of 240. Note, speed will be remembered until a new speed command is set. 'G1 O S220' will move the hand in the Hook grip in the open direction at a speed of 220. Using an advanced command 'A#' allows different modes and settings to be configured, a full list of these settings are displayed by entering the '?' command. For details on the different control methods available within Beetroot V1.0, visit our Control Methods Guide. CSV mode allows the position of each finger to be controlled at a faster rate than normal serial control mode, and is very suited to interfacing with desktop applications (e.g. Matlab, Python). In this mode, the hand is able to receive the target position for each finger in the Comma Separated Value (CSV) format. To enable/disable this mode, enter the serial command 'A4'. This setting changes the default hand control mode, meaning that on power up the hand will remain in this mode, until it is disabled by entering the command 'A10. The format for the CSV string for both the setting the target position of each finger is detailed below. Where position 0 is a fully extended finger (open), and position 1023 is a fully contracted finger (closed). WARNING, WE STRONGLY ADVISE THAT YOU ONLY USE A VALUE BETWEEN 50 - 973 TO PREVENT THE MOTORS FROM HITTING THEIR MECHANICAL ENDSTOPS. In normal serial mode, the position value 0 - 100 is mapped to 50 - 973, meaning there is no chance of the motors hitting their endstops. For example, sending the following string will move all of the fingers and the thumb to the mid-position. The target position of each finger is stored until it is overwritten by the latest target position CSV string. The current position of each finger can be requested by entering the serial comment "A6", and is displayed in the same format as detailed above. Therefore you can send a single target position command, and only send the next target position command until you read that the current position has reached the previous target position. In this tutorial you'll learn how to download and install the Artichoke V1.2 firmware for the Ada robotic hand. Artichoke is the version of hand control firmware designed for the Ada hand, running on the Almond board. Artichoke includes full serial control of individual fingers and grip patterns, muscle control through EMG sensors and provides a framework for adding extra functionality to the hand (nunchuck/joystick control). 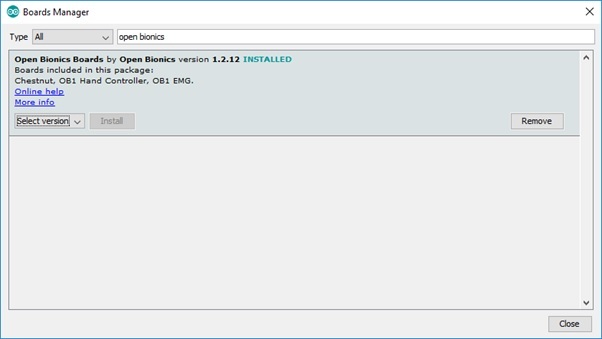 As with all of Open Bionics developer materials, this firmware is completely free to download and use, and we strongly encourage you to incorporate this into your projects, to improve it and build upon it. Before downloading Artichoke, you need to download and install FingerLib.h, a custom finger control library. FingerLib.h is designed to run on a number of different Arduino compatible microcontrollers, and manages all of the low level motor control and handling of timers, it also includes various example sketches for simple finger control applications. After FingerLib.h has been downloaded, we now need to download Artichoke and upload it to the Almond board. Once uploaded to the Ada hand, connect to the hand via the Serial Monitor. On the bottom right hand corner of the Serial Monitor, set the baud rate to 38400, and set the line ending to 'Carriage Return'. You should first be greeted with a printout of the firmware version number and board name, followed by a list of possible serial commands. The demo mode should then start, and can be disabled by entering 'A0', without the apostrophes. Entering 'A0' toggles whether demo mode will run on start up (default enabled), and entering 'D' will run demo mode once. At any time, if you enter '?' the hand will print the list of serial commands, and entering 'A1' will toggle whether the serial commands display on start up. Note that all characters must be uppercase. The fingers can be controlled individually by entering 'F#', where # is a finger number between 0 - 4. You can also set the fingers to move to a certain position (P0 - P100) for a selected grip or finger, for example if you enter 'G5 P50' the hand will move to the halfway position of the Tripod grip, or with 'F1 P10' the Index finger will be almost fully closed (P0 = fully open, P100 = fully closed). The speed can be set in a similar manner by entering 'G# S??? ', where ??? is a number between 0 - 255 (note that due to the PWM frequency, the motors will struggle to move at any value below around 200). Using an advanced command 'A#' allows different modes and settings to be configured, a full list of these settings can be seen by entering the '?' command. For details on the different control methods available within Artichoke V1.2, visit out Control Methods Guide. The 2 data lines passed through the 3.5mm headphone port on the Almond board are connected to both I2C pins and analogue pins (through a 10k resistor). If the headphone port is being used for analogue data (e.g. muscle sensors), you should not initialise I2C. When using I2C (e.g Nunchuck), the analogue pins need to be pulled high to act as the pull ups for the I2C lines. In this guide you'll learn about the various methods for controlling the Ada robotic hand. With the release of Artichoke V1.2, the Ada hand can now be controlled using number of different methods. It also includes a several modes geared towards use in a research environment. This guide will detail the various options for controlling the hand, as well as the different types of data outputs which can be used for simulation, analysis or control. The Ada hand can be controlled by a number of different control methods. The above lists will be constantly updated as new control methods are developed. For most applications, the most suitable control method will be to connect the Ada hand to a computer and to control it via a serial connection. All of these serial control methods require a 'Carriage Return' as the line ending. This mode is the default control mode of the Ada hand, as it is very user friendly and slightly resembles the Gcode format. This control method is explained in detail in the Artichoke V1.2 Firmware User Guide. Low latency mode allows the position of each finger to be controlled at a faster rate than basic mode, and is very suited to interfacing with desktop applications (e.g. Matlab, Python). This mode receives the target position for each finger, and outputs the current position of each finger in the Comma Separated Value (CSV) format. To enter into this mode (aka 'Research mode 0, finger position control') enter the serial command 'A10'. This setting changes the default hand control mode, meaning that on power up the hand will remain in 'Research mode 0'. To disable this mode, enter the command 'A10. The format for the CSV string for both the setting the target position and reading the current position of each finger is detailed below. WARNING, WE STRONGLY ADVISE THAT YOU ONLY USE A VALUE BETWEEN 50 - 973 TO PREVENT THE MOTORS FROM HITTING THEIR ENDSTOPS. In Basic Mode, the position value 0 - 100 is mapped to 50 - 973, meaning there is no chance of the motors hitting their endstops in Basic Mode. For example, sending the following string will move all of the fingers to the mid-position. The target position of each finger is stored until it is overwritten by the latest target position CSV string, but the current position of each finger is printed over serial constantly. Therefore you can send a single target position command, and only send the next target position command until you read that the current position has reached the previous target position. The Artichoke firmware and the Almond board are configured so as to allow the Ada hand to be controlled via Electromyography (EMG) sensors. These sensors attach to surface electrodes placed on the forearm, and detect when the muscle is active. For a complete tutorial on this control method, visit our Muscle Control Tutorial. Any release after Artichoke V1.1 allows the Ada hand to be controlled via a Wii Nunchuck. This control method is called the 'HANDle', and is the most intuitive control method. This control method most suited to tasks that require grasping motions. For a complete tutorial on the HANDle, visit this tutorial. The Ada hand is very suited to being integrated into projects using Matlab. With the hand in low latency mode (Research Mode 0), Matlab can be used to receive the current finger position data as a CSV string, which can then be split into it's individual components and logged. A simple Matlab UI could also be implemented to control the position of each finger using sliders, where the slider value for each finger is concatenated into a CSV string, which is then sent to the Ada hand. The Ada hand has been designed as a research platform. We fully encourage the addition of extra sensors for force feedback or other metrics. There are two main options for adding extra sensors to the hand, detailed below. The Almond board datasheet details the unused Atmega2560 pins which have been broken out to the edge of the board. These can be used to communicate with external sensors, detailed below. Various sensors, such as Force Sensitive Resistors (FSR), can be soldered to the Almond board directly. The Artichoke firmware would then need to be modified to read the added sensors and print them over the serial port to the computer. One advantage of using this option is that it requires only a single serial connection (Hand - Computer), resulting in a relatively compact and portable system. The disadvantages of this option are that a maximum of 2 analogue pins are available. Furthermore, the sample rate of the sensor over the serial port may be slow, as the Artichoke firmware still needs to perform the various hand control functions. A simpler option is to buy a small arduino (ArduinoNano) and connect the sensors to this extra arduino. The software running on the extra arduino can be incredibly simple, thus increasing the sample rate. It would also allow many more analogue inputs. The disadvantages of this option are that the setup would require 2 serial connections (Hand - Computer, Extra arduino - Computer).